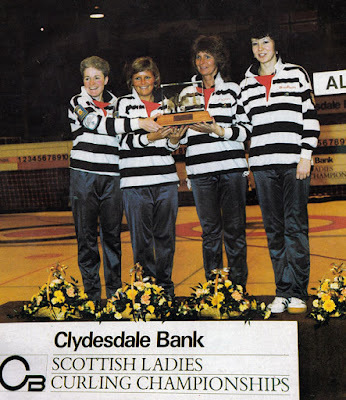 The Clydesdale Bank was for many years a great supporter of women's curling in Scotland. 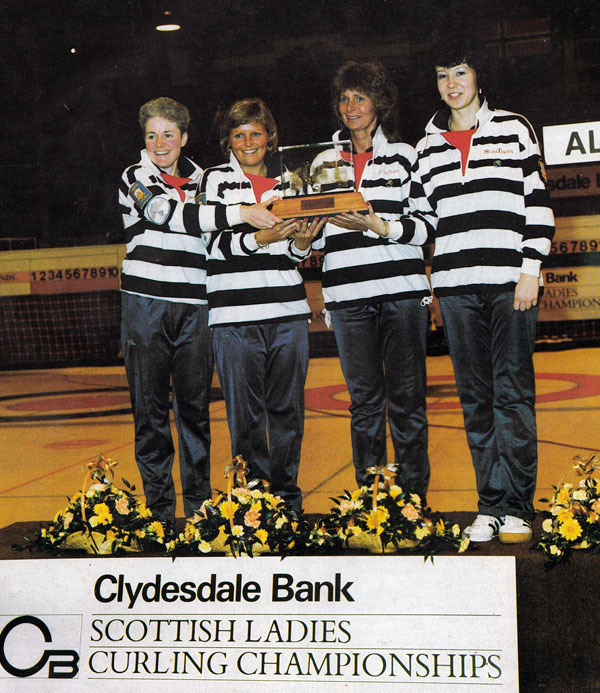 The bank first came aboard in October 1977, when the national competition was to find a team to represent Scotland at the European Championship. The European playdown the following year was called the Clydesdale Bank Scottish Ladies Curling Championship. 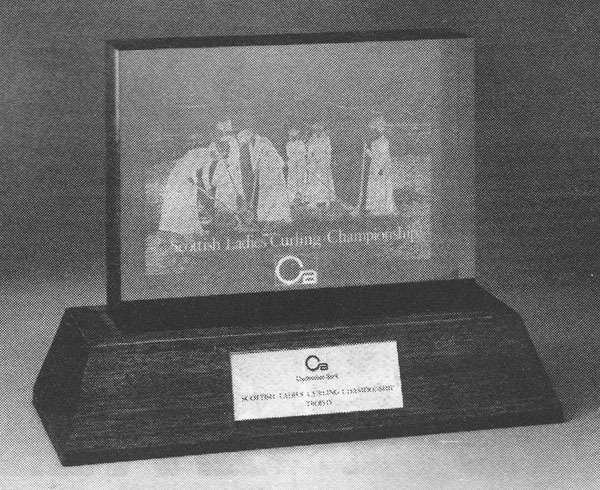 In 1979 this competition was to lead to a world ladies championship, for the first time. The Clydesdale Bank's sponsorship of the national championship continued. For the 1987-88 season, a new trophy was commissioned. That's it above, from the February 1988 Scottish Curler, without photo credit. For its time it was rather unusual. On the glass slab on the top of the trophy was etched an old photograph, more about which below. At the time of the presentation of the new trophy Ian McLellan was Public Relations Manager for the Clydesdale Bank, and his 'assistant' was Alan Sloan, who is still well known to curlers today as the chair of the Glynhill organising committee. The Clydesdale Bank sponsorship came to an end in 1992, after sixteen years. Here are the first winners of the new trophy in 1988, from the February 1988 Scottish Curler, uncredited: (L-R) Sheena Drummie, Kimmie Brown, Margaret Scott and Christine Allison (skip), who beat Jane Gallagher and her team of Kathy Cameron, Billie-May Muirhead and Jennifer Blair, 6-3 in the final at Kirkcaldy. The curling historian will want to know more of the old photograph etched onto the new trophy. 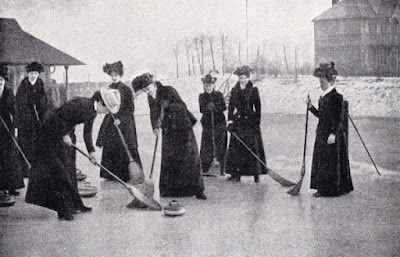 It shows women on the ice at the Braid Estate Recreation Grounds, Edinburgh on a rink on the tennis courts. The Braid Tennis Club occupies the site today. 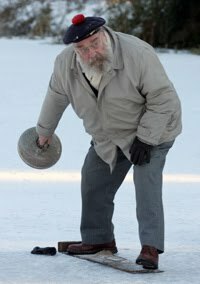 The use of tennis courts for winter curling was not uncommon in the early years of the twentieth century. The photo can be found in the Royal Caledonian Curling Club Annual for 1902-03. It was reproduced in the Scottish Curler magazine of September 1955, from which this image is scanned. Unfortunately, the photographer is not recorded in either the Annual nor the magazine. But it can be dated fairly accurately, most likely to the winter of 1901-02. "BRAID ESTATE RECREATION GROUNDS. LADIES' CURLING CLUB. THIS club, composed of three rinks, was formed in the winter of 1901-2, at a meeting held in the Tennis Club Pavilion, the use of which is kindly granted to the club during the curling season. A president (Miss E W Hardy), vice-president, secretary, and executive committee were appointed. The club is under the patronage of Lady Gordon Cathcart, proprietrix of the Cluny estate. The ice is made by means of spraying the ash tennis courts; and within six to eight hours a beautiful sheet of ice is obtained. At the close of each day's play the ice is renewed by spraying, which only occupies about fifteen minutes, and 'new leads' are ready for the morning. The rinks are arranged to run across the tennis courts, which, being over fifty yards in breadth, give full-length tees. A new use is thus shown for tennis courts, which previously lay useless during the winter months. This is a suggestion which is worthy of being taken up by country clubs who have difficulty in finding good and safe ice. School play-grounds could be largely utilised for skating and sliding-places for the children. As the ice is from a quarter of an inch to any thickness, resting on the solid ground, there is no fear of a ducking! Ice curtains are hung round the rinks, and do good service in keeping off the rays of the sun, which is often more powerful in winter than in summer now-a-days. The Braid Estate Recreation Grounds are beautifully situated near the Braid Hills, and at the foot of Blackford Hill, the scene which Sir Walter Scott spoke of as so dear to him in his boyhood. It is three minutes walk from train and car. A gentleman's club has been in existence for two or three years, and some roaring games have been enjoyed. The use of the tennis pavilion is a great boon, for there is a capital gas stove where hot soup, coffee, etc, call be easily made. Several exciting games and matches were played by the ladies, and the club received challenges from the Hamilton and Broughty Ferry ladies' clubs. A thaw unfortunately prevented them being accepted, but the Braid Ladies hope to meet them both next season. A pair of stones presented by Mrs Forrest, the vice-president, were played for by the club, and won by Miss E Dunn, who was also presented with a pair of silver-mounted handles by Edward Bayley, Esq." I was excited when first reading the above, not only because it records the use of the tennis courts in some details, but it also seemed to record another pioneering women's curling club, joining the list of Hercules Ladies, Boghead Ladies, Balyarrow Ladies and Cambo Ladies as well as the 'ladies section' of the Broughty Ferry CC, not forgetting Henrietta Gilmour and her team, from Lundin and Montrave CC, see here, all active on the ice at the beginning of the twentieth century. But all is not what it seems. The Braid Hills Ladies did not exist as a separate club for long, and perhaps never had an identity separate from the men. You see, the Braid Estate Recreation Grounds Curling Club was not admitted to the Royal Club until the Annual Meeting of the Representative Members of the Royal Caledonian Curling Club, held in the Royal Hotel, Edinburgh on July 30, 1903. The Braid Hills Estate club was proposed by Colin Moffat, of the Waverley CC, seconded by the Reverend John Kerr, and was one of eleven new clubs joining the national body that year. But this was not a women's club. The club membership roster in the 1903-04 Annual shows there were twenty-seven male Regular and Occasional members, with an additional fifteen women, listed as 'Occasional' Lady Members. One has to ask why the original aspirations of the women to form their own club, as recounted two years earlier, had not been realised. What had happened to the secretary and executive committee mentioned in the 1902-03 Annual? If there had been a women's club, why had this not lasted on its own for more than a year or two? And had the women decided to join the men's club willingly? I don't know the answers. Here are the names of the women on the club roster in 1903. The Miss Hardie could be the 'Miss E W Hardie' who was named President in 1901-02. The 'Mrs Forrest', the Vice-president who had presented stones to be played for by the club, could be the 'Miss Forrest' on the list. There are two members named 'Miss Dun' (sic), and one of these must be the Miss E Dunn who won the stones. The Braid Estate CC prospered, simplifying its name to the Braid CC in 1905. It constructed another pond, with four rinks, not far away from the tennis club, at the east end of Cluny Drive, at the foot of Blackford Hill. 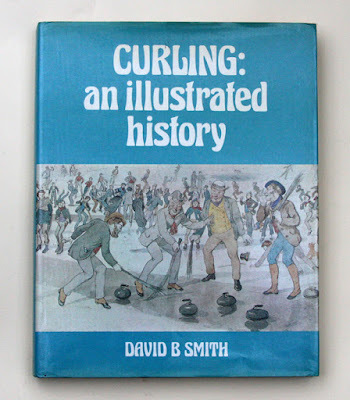 The two locations can be found on the Scottish map on the Historical Curling Places website, here. By the outbreak of the Great War, the Braid CC had twenty-seven male members and just four women. One of these, Miss Brander, was a very accomplished player, skipping her rink of Mrs Armour, Miss Mackintosh and Miss Taylor to the final of the first competition for Sir John Gilmour's Cup in January 1914, where eight women's teams took part in the event at the Edinburgh Ice Rink, Haymarket, that indoor rink having opened in 1911. The Gilmour Cup can be identified as the first open women's competition in Scotland, see here. The Cup was won by the Balerno rink skipped by Mrs Brodie. The runners-up were entered under the Braid CC name. Three of the team are three of the four names recorded in the Braid CC's membership roster in 1914 - Miss Brander, Miss Mackintosh and Miss Taylor. All had been club members since 1903. They may even have been in the 1901 photograph! The other member of the Brander rink was a Mrs Armour, who was one of seven 'Occasional Lady Members' listed in 1912. I do not know the whereabouts of the original image of the lady curlers on the Braid Hills pond in 1901, nor what happened to the Clydesdale Bank trophy after 1992. If you know, do email me with the details. Images are as identified in the text.